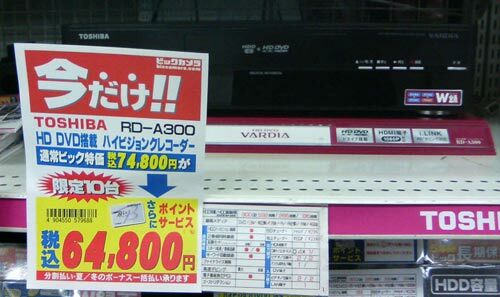 In fact, a new survey by Nikkei Publications has found that almost half of respondents think Toshiba should never even have bothered with HD DVD in the first place. Asked, “At what point do you think Toshiba should have decided to withdraw from the HD DVD business?” 43 per cent said it should have done so in 2005 when it was still in talks with the backers of Blu-ray about finding a common high-definition format. The poll of almost 1,000 Japanese geeks offered some small consolation for Toshiba in that just under 30 per cent backed its choice to wait until now to pull the plug.